OurSpace was developed to study how children collaborate on a meaningful and challenging design task with an interactive tabletop. 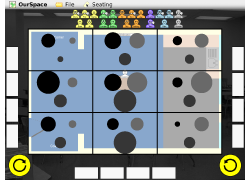 Groups of three children used an interactive tabletop to design a desk layout and seating arrangement for their classroom. How are the desks grouped? Who should sit next to whom? Who should sit at the front, middle, and back of the class? This is a task a teacher normally does; here, we provided the opportunity for children themselves to explore how to accomplish it. To avoid singling out individuals, the scenario was to create a seating arrangement for the class coming in next year. The class was fictitious, but we kept to the same number of students and desks as the current class. To avoid gender biasing, we labeled the students with gender-neutral names. To make the task more challenging and engaging, we added different characteristics to the student icons based on criteria that students mentioned during prototype iterations. Friendship groups were indicated by icon color; to simplify, there were no overlapping friendship groups. Talkative students had an open mouth and speech bubble. Those with vision problems were shown with glasses. All groups completed the task in both a single-touch and multiple-touch condition. In the single-touch condition, the tabletop surface allowed only one child to interact with the digital content at a time. In the multiple-touch condition, the children could interact with the digital content simultaneously. Surprisingly, touch condition did not significantly impact either physical or verbal equity of interaction. We posit that this was due to the handover between active users being minimal. As expected, frequency of physical interaction was higher in the multiple-touch condition. Qualitatively, children in the multiple-touch condition talked more about the task; in the single-touch condition, they talked more about turn taking. We also found age and gender differences. We investigated how tabletop position affected where children touched, finding that there was a sharp drop-off about two-thirds across the room; we posit that this is a function of both comfortable reach and taking charge of the design space nearest one’s location. Fleck, R., Rogers, Y., Yuill, N., Marshall, P., Carr, A., Rick, J. and Bonnett, V. (2009). Actions speak loudly with words: Unpacking collaboration around the table. In Proceedings of ITS ’09. ACM Press.